New research suggests that administering taurine, a molecule naturally produced by human cells, could boost the effectiveness of current multiple sclerosis (MS) therapies. 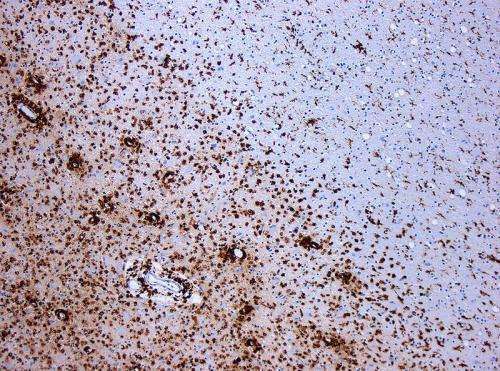 Scientists at The Scripps Research Institute (TSRI) found that taurine helps spark a process called remyelination, which is crucial to repairing the nerve cells damaged in multiple sclerosis. "Remission of MS symptoms is dependent on the process of remyelination, so using taurine in combination with an existing MS drug and a future remyelination-inducing treatment may help patients by improving overall efficacy," says Luke Lairson, PhD, assistant professor of chemistry at TSRI and co-senior author of the study. "This could be something to add to an MS therapeutic regime." The discovery also highlights the potential for a technique called "metabolomic profiling," which can identify useful endogenous metabolites the body already makes in small quantities, such as taurine, for new applications in drug therapies. "Metabolomic profiling can offer unique insight into many different diseases, both mechanistically and therapeutically," says study co-senior author Gary Siuzdak, PhD, senior director of TSRI's Scripps Center for Metabolomics and professor of chemistry, molecular and computational biology. Multiple sclerosis is an autoimmune disease that develops when the body begins attacking the protective myelin sheaths on nerve cells. Without healthy myelin sheaths, nerve cells cannot communicate properly, and patients experience symptoms such as numbness, difficulty walking, slurred speech and vision loss. Although there is no cure for MS, some current drug therapies can reduce MS relapses by encouraging re-myelination. In a 2013 Nature study, Lairson and colleagues showed that the drug benztropine, approved for Parkinson's disease, may also help MS patients by inducing cells called oligodendrocyte precursor cells to mature into myelin-producing oligodendrocytes and repair damaged nerves. Lairson's next step was to find molecules that could make remyelination-inducing drugs even more effective, so he teamed up with Siuzdak to test the potential of molecules called endogenous metabolites to influence oligodendrocyte precursor cells. Endogenous (meaning "originating from within") metabolites are molecules naturally made by cells and include sugars, fatty acids and amino acids. The new analysis and follow-up tests in cells showed that while the endogenous metabolite taurine cannot induce oligodendrocyte precursor cell maturation on its own, it can lend a helping hand when combined with the drugs benztropine or miconazole. The researchers described taurine as a "feedstock." "Combining taurine with drugs that induce differentiation significantly enhances the process," says Lairson. "You get more myelin." Lairson says this discovery is exciting because taurine has already been shown to be safe at certain doses and is readily used by the brain. "We still need to do tests in rodent models, but this is a good starting point," he said. With this study's finding that administering a particular endogenous metabolite can influence a cell's fate and function, researchers have a new path for developing novel therapies for many diseases. Metabolomic profiling takes advantage of technical developments, led by Siuzdak at TSRI, which scientists can use to analyze metabolic perturbations in disease and then apply that information to decipher mechanistic details. Ultimately, researchers hope to identify active endogenous metabolites with potential to reverse pathology-related phenotypes. Siuzdak is encouraged by the nearly 21,000 scientists who currently use his lab's cloud-based XCMS/METLIN metabolomic profiling platform for these types of studies—and the interesting active roles metabolites are exhibiting. "Unlike other omic technologies, the beauty of metabolomics and activity testing is that metabolites are readily commercially accessible, generally inexpensive, and can directly impact phenotype quickly," says Siuzdak. "We are no longer passive observers but instead active participants."